Tooth staining is a common cosmetic issue affecting both men and women. It can be the result of some foods and beverages, such as red wine, sweets that contain abundance of artificial dyes; unhealthy habits, such as smoking, or simply genetics. Now, the market offers a plethora of commercial tooth-whitening products. But, these are both expensive and time-consuming, and what’s more, they often fail to provide the desired results. 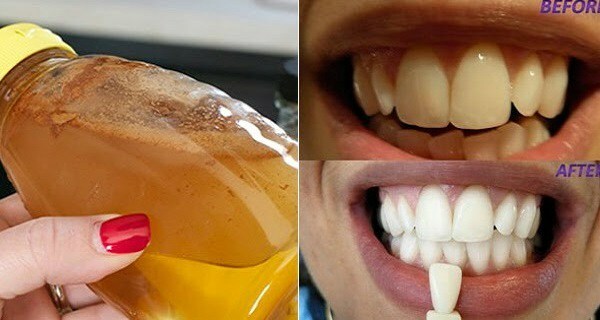 On the other hand, you have all-natural alternatives, such as the one with apple cider vinegar, which provide amazing tooth – whitening results. Apple cider vinegar is the byproduct of apple fermentation; it’s loaded with pectins, healthy enzymes and essential minerals. When it comes to oral health, it works on two levels – it eliminates tooth stains, whitens your teeth and destroys all mouth bacteria that cause bad breath. First of all, apple cider vinegar is a powerful antiseptic, which means it effectively kills all the bacteria in the oral cavity. Second, it’s also a potent cleansing agent that removes stains and whitens your teeth at the same time. The treatment couldn’t be simpler. Just mix about ½ tsp. apple cider vinegar with a cup of water and gargle in the morning. Be aware that undiluted ACV can damage your tooth enamel so make sure you always mix it with water before the treatment. Also, don’t forget to brush afterwards. Do the treatment on a regular basis to eliminate stains on your teeth and whiten them. Always shake the bottle with ACV before use because the important nutrients normally fall at the bottom. ACV is highly acidic in nature meaning it can damage your tooth enamel if used undiluted. Don’t use the ACV treatment more than once a day so as to avoid damaging your tooth enamel.